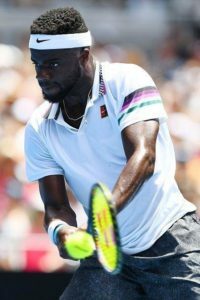 American-Sierra Leonean Frances Tiafoe is looking forward to creating a further upset in the ongoing Australian Open when he takes on Rafa Nadal today in the quarter-final. Tiafoe who is the son of immigrants from Sierra Leone has already created an upset in the competition, thanks to a stunning win over Bulgaria’s Grigor Dimitrov last Sunday to reach the last eight for the first time in a major tournament in his career. The 21-year-old knows he is up for a tough test as he looks forward to keeping the big dream alive, as the Spaniard is yet to drop a set in the tournament. Tiafoe said: “I told my parents ten years ago I was gonna be a pro tennis player and change their life. Now I’m in the quarter-finals of a Slam. I can’t believe it,” the world number 39 said. For Nadal, the battle against Tiafoe will not be as smooth as anyone may think. “Going to be a tough one, as you can expect in the quarter-finals of a Grand Slam,” Nadal said. Already the quarter-final match between the two is considered as a match of two unequal opponents, better still David and Goliath. Tiafoe is looking forward to a huge upset after he has already caused two against higher ranked opponents – against Kevin Anderson and Gigor Dimitrov and this must have given him a lot of confidence going against Nadal.